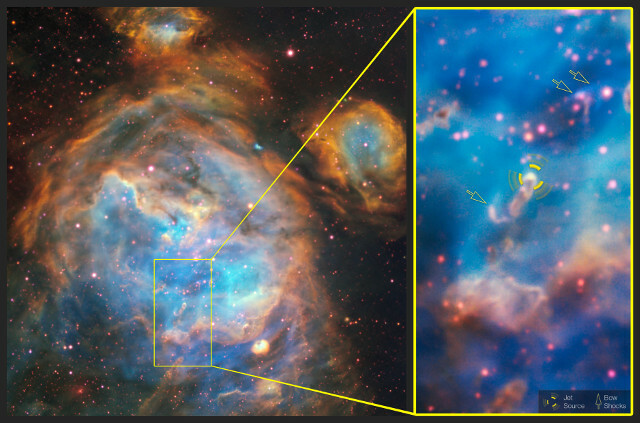 N180 B, framed in the top image (ESO, A McLeod et al.) is a region of the type called H II because it consists of an interstellar cloud composed primarily of ionized hydrogen. These are star formation regions, nurseries in which hydrogen can form massive stars that start emitting very strong electromagnetic radiation that cause the hydrogen’s ionization which in turn generates the colors we can see. In this case the spectacular result is shaped like a giant bubble with four other smaller bubbles around it. Within the larger bubble, the researchers detected a young stellar object thanks to the MUSE (Multi Unit Spectroscopic Explorer) instrument, which became operational in 2014 and was upgraded in 2017 to provide 3D images of the objects observed, which combines spectrography and photography to observe large astronomical objects in a complete way at once. A star still in the early stages of its life that precede the main sequence in which its normal life will be spent, is emitting a jet of materials. The result is what’s called a Herbig-Haro object, hence its cataloging as Herbig-Haro 1177 or simply HH 1177. The bottom image (ESO, A McLeod et al.) shows N180 B and in the yellow rectangle the details of the area around HH 1177. Normally that type of jets is obscured by the dust that surrounds them and consequently can be detected at infrareds and radio waves requiring the use of specialized instruments such as radio telescopes. 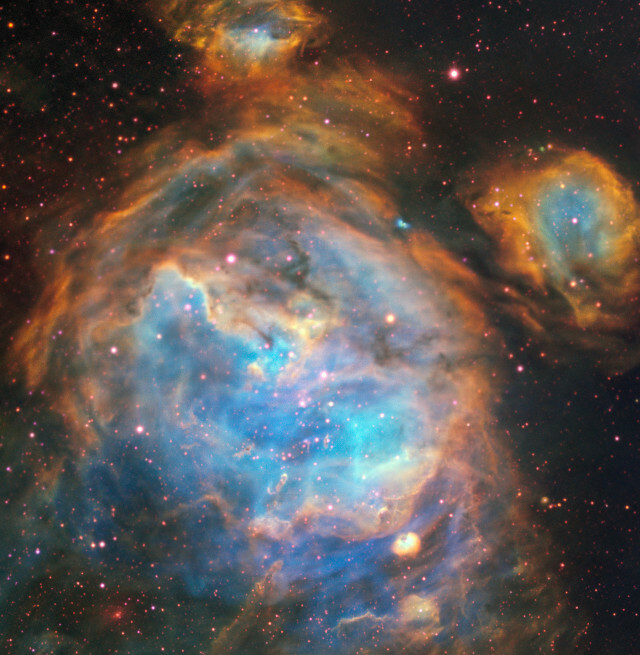 However, the Large Magellanic Cloud is poor in dust so that type of jet can be detected at visible frequencies as well. It has an estimated length of almost 33 light years and this means that it’s one of the longest jets ever observed. The star that emitted it has a mass estimated at about 12 times the Sun’s. The light beam coming from the jet of HH 1177 is highly collimated, barely widening as it moves away from the star. Jets of this type are associated with star accretion disks and can provide information on the mechanisms for of matter gathering by stars during their development. Both large and small mass stars emit collimated jets such as HH 1177 through similar mechanisms, suggesting that massive stars can be formed in the same way as smaller ones. As it happens many times in the field of astronomy, breathtaking images can be appreciated by the public for purely aesthetic reasons but at the same time offer researchers many useful information to study cosmic phenomena. In this case it’s the formation of massive stars but the results can also be useful to understand how the Sun was born with its planets.